Eddie Howe on the 4,259 away fans at Reading: "That was emotional, the travelling support we had was superb." 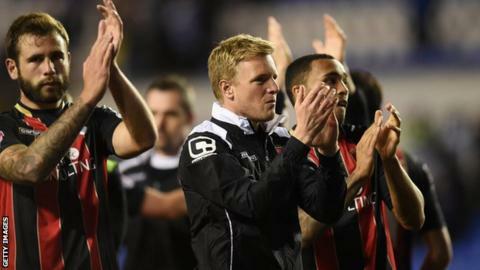 Bournemouth boss Eddie Howe wants three more positive performances from his table-topping side as they look to seal promotion to the Premier League. The Cherries claimed a battling 1-0 win at Reading on Tuesday to maintain a one-point lead over second-place Norwich in the Championship. Middlesbrough and Watford also remain in the hunt for automatic promotion. "The best sides find a way to get a goal. That was us and we are going to need it three more times," Howe said. Bournemouth, who have already sealed a place in the play-offs, next face Sheffield Wednesday at the Goldsands Stadium on Saturday, followed by another home game against Bolton on 27 April and a final-game trip to Charlton on 2 May. "From our perspective is, we are very much trying to control our side of things," Howe told BBC Radio Solent. "Internally we have said 'expect all the sides up there to win every game' and then our message is clear, our job is clear, our task is clear and therefore it's black and white. If we are good enough to do it, then great." The 37-year-old, whose side are the top scorers in the top four English divisions with 90 goals, added: "It's great to be in the play-offs. We've never been in this position before. We've come from nowhere this season to be where we are. So that's a real achievement." Callum Wilson tapped home the only goal of the game - his 22nd of the season - in the fourth minute of the match at the Madejski Stadium. Howe's side then needed a stunning one-handed save by Artur Boruc from Jamie Mackie's volley to help seal a vital victory, their sixth in their last eight league matches. "It was a different kind of win for us but performances now are of less importance than results," Howe admitted. "I'd much prefer that we were playing total football as we've done the majority of the season. But we're finding a new way to win and I'll take that at this stage. "We almost scored too early, it made it a difficult one for us. Reading are a good side - they've got really good players, they set up a system to strangle our midfield and make it difficult for us to penetrate them. "The early goal was a good thing but it made it a nervy second half. We really had to dig in and show our discipline, work rate, steel and defensive qualities. "I'm not going to lie - it wasn't easy watching it because you cannot influence it. At that stage it's all about the mentality of the players. How brave are they going to be? "I've got two players in there with concussion. They put everything on there. Artur Boruc made an outstanding first-half save and you are going to need those moments of brilliance to get you over the line. "I could never criticise these players for not giving everything and that's what you saw tonight. When they came off the pitch they left it all out there and they did Bournemouth proud." And Howe admitted the scenes at the end of the game when he and the players thanked the 4,259 Bournemouth fans who had made the journey was a special moment. "The travelling support we had was superb. It's rare you get those moments in football and you have to enjoy them."